This new release is almost entirely dedicated to a powerful new feature implemented as a part of Metric Insights package: Datasets. Datasets offer an innovative approach to data analysis, processing and security. Snapshots of data from any Data Source without having to create and maintain "staging reports". Simple or compound rules that limit information by more specific parameters. The results set achieved via combining various fields and the rules applied to them may be saved as separate View. This View can be used independently for data analysis or be used to build Reports and Metrics from it. See more details below. Datasets functionality presents an enhanced process of creating system elements (Metrics and Reports). 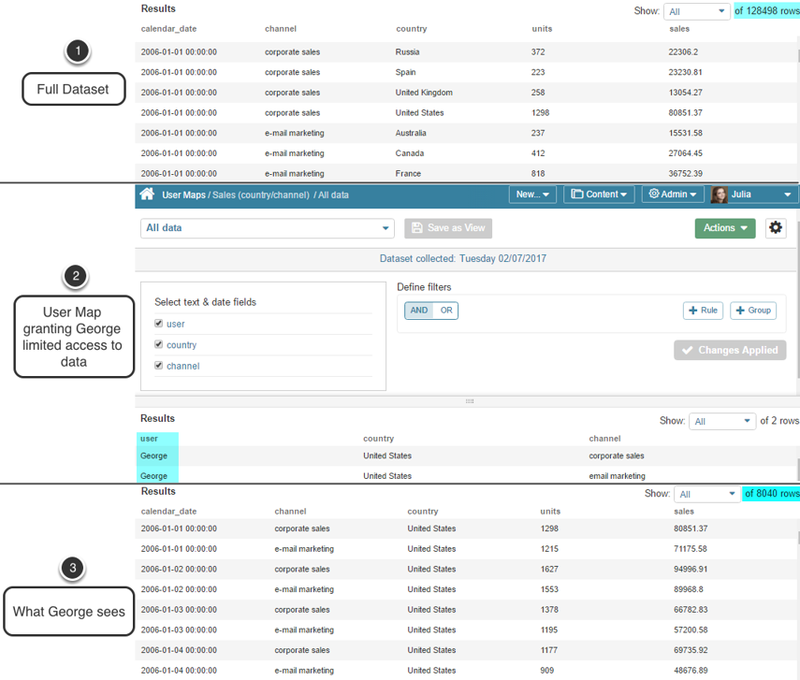 At the left top corner for the screen, choose a public Dataset View that you would like to turn into a Metric or Report. Metric data requirements: Since Metrics always represent time series data, in order to create a Metric it is critical to filter a column of dates and a column of values. There are no specific requirements for creating Reports, since they may contain various data. At the right top corner of the screen, click Actions and select whether you want to Build a Metric or Report. 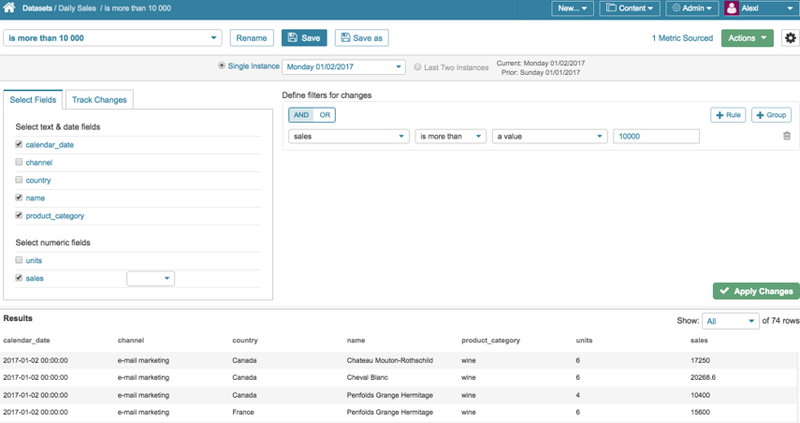 The system automatically creates the selected element with the presets (selected data, aggregation method, Name, Category) in the Dataset View. Despite the new automated process, the new element can be customized according to your specific requirements: change Name, other settings or make it a dimensioned element (if applicable). User Maps represent a deeper security level that allows defining specific slices of data (rather than the entire Dataset) to be made available to Power Users and Regular Users based on each user's areas of responsibility. NOTE: To grant Power Users and Regular Users access to Datasets, they should have the respective Privileges enabled at the User Editor. For more details refer to Dataset Security Overview. We have a Dataset with information per sales in different countries and via various sales channels. The full dataset contains 128 498 rows of data; however, we do not want all users to have access to all the data. We create a User Map and apply it to the Dataset. User Map must contain a column with usernames and other column(s) that can be applied to the Dataset to filter it down to the relevant subset: user map partitions the result set containing ALL Information and sends different mappings only to the specified users. In our example, we gave George access map to the Corporate Sales Channel in Canada and Australia. Log in as a User from the User map. Although George opens the source Dataset, he can see only 8040 rows. Dataset Views and elements built from this Dataset are also going to have limited display both when previewing them in the system and during distribution: sent via Favorite digests, shared, sent via Bursts or Alerts. Regular and Power Users from the User Map are going to see only the data allowed by the User Map; users not listed in the User Map (except for Admins) will have no access to the Dataset data. However, Datasets provide extended functionality by allowing the ability to choose certain fields, create complex filters and save your selection as custom Views which can be further used for creating new Reports and Metrics in few clicks. Datasets are aimed at automating system behavior and releasing Administrators from ineffective routine tasks. Taking this into account we offer an ability to effortlessly migrate data from regular Reports into Datasets. NOTE: Change reports and reports sourced from data files, metrics, or other existing reports can not be migrated. We have also revamped the Visual Editor so that it is now set as a default option for Tableau and Qlik plugins. Access Report Editor > Report Content tab. 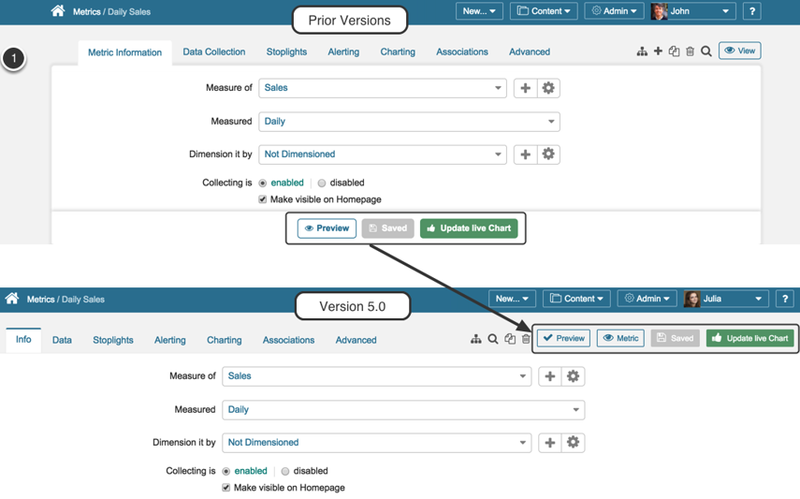 In versions prior to 5.0 we offered an ability to include external charts using links to the other objects with an ability to adjust width and height of External Image. In a new Version we have extended this functionality and now it is possible to combine internal Report and Tableau Visualizations in one Viewer. When configured with Bursts or Alerts, these mixed data can be delivered to users by email. Tableau filter (such as 'country' in this example) is mapped to matching column in the Standard Report - this is how we ensure that we include relevant related visualizations. You can display one Visualization per all values that match in Tableau filters and in the Standard Report or have a separate Visualization per each such value. 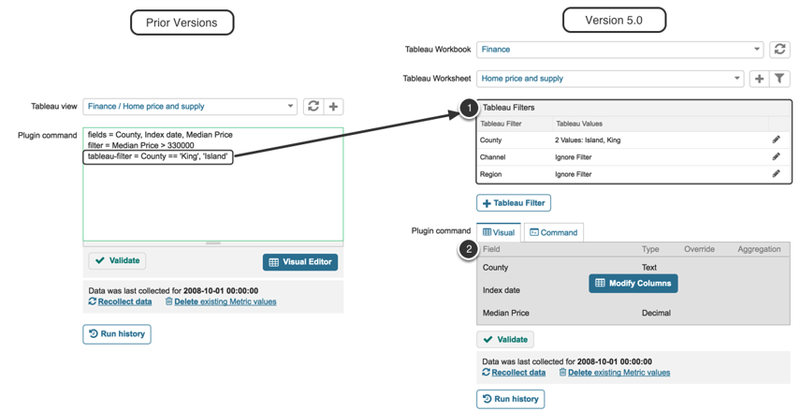 In the context of example related to 'countries', if there is 'United States' value both in the 'Country' column of the Report and as an option of Tableau filter, Visualization is going to be filtered out to United States only. The Preview, Save and Update Live Chat buttons on the element Editors have been moved to the top right corner of the page. The bottom part of the page is now be available to review Result sets and check data quality instantly before updating elements. Incorrect display of Database tables rather than Available Reports when using Data Source = "Existing Reports - SQL"
Legend in Multi-Metric Viewers: If there is a great number of Overlays on the Multi-Metric Chart, the Legend layout is compromised, and the Legend may overlap the Range Selector. Incorrect sequencing of numeric Dimension Values upon creation. The process of deleting Dimension Values may be taking too much time. Power User Permissions issue: Power Users with Edit Access to a Report can see all Dimensions created in the system at the Report Editor > 'Info' tab > 'Dimension it by' field although they should see the list of only those Dimensions to which they have been granted access. 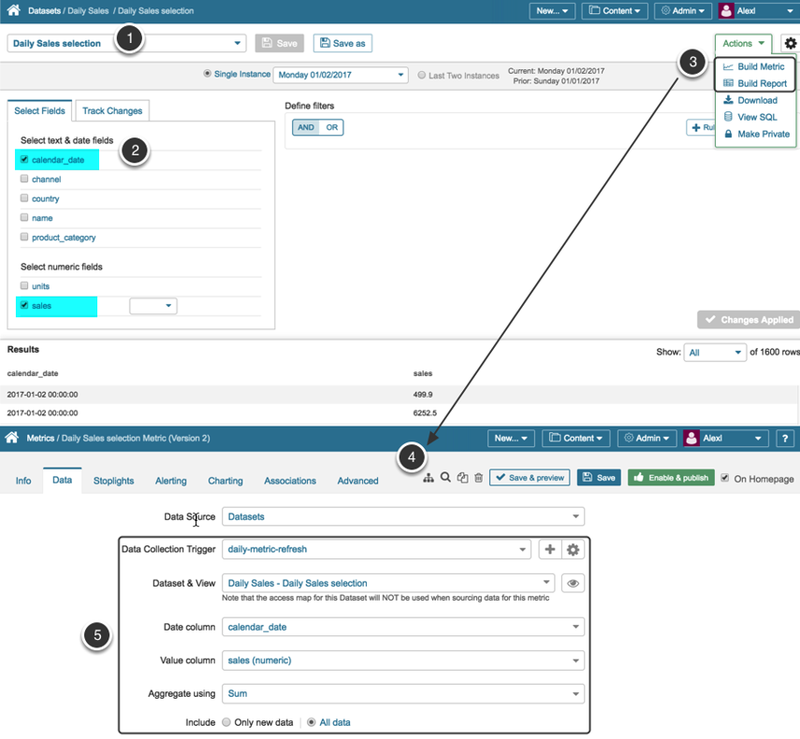 Duplicating Dataset-based elements: A Power user with Edit Access to a Dataset-based element but with no View or Edit access to the original Dataset, may not duplicate this element properly since the user will not be able to choose the Dataset or its Views as the source of data for the duplicated element. Dynamic Pivot Table: The display of "Sum as a fraction of Columns' has been fixed. Homepage: If the variable MAXIMUM_HOME_PAGE_TILE_COUNT at Admin > Utilities > Config Variables has been set to the number which was less than the actual number of tiles at the Homepage, tiles were not displayed at the Homepage. This has been fixed. Metric Calendar: The issues appearing after changing time zone on local machine have been corrected. Report Legend Order: An issue with ability to change order of items in Chart's legend has been fixed. Top-10 Dimension values feature: The feature where we purge old Dimension values and collect new ones in every cycle has been corrected. You can find it at Dimension Editor > Advanced tab > Other: Delete Dimension Values not found in result set? field. Use-case: I want a Daily Sales metric that is dimensioned by Product, but I only want to see the top 10 products. When the metric is refreshed tomorrow, the list of top-10 products might be different. I don't want to see any products that are no longer in the top 10.